PHUKET: The recent revelation by Phuket Governor Chockchai Dejamornthan that he will start taking steps to have all beaches in Phuket cleared of vendors and returned to “virgin” status has received a mixed reaction among expats and foreign visitors in an online poll by The Phuket News. Currently, the “10% zones” are the last bastions where vendors may work at selected beaches in Phuket, and were introduced by Phuket’s previous Governor, Chamroen Tipayapongtada. However, the “beach rules” in Phuket specifically apply only in Phuket. The 10% rule does not apply anywhere else in Thailand, not even in Khao Lak, just one hour’s drive north of Phuket, or even on Phi Phi or elsewhere in across the bay in Krabi. Gov Chockchai last month explained that his understanding was that local authorities had no legal right to allow any vendors on the beaches, and that he would have them removed. The poll, which ran for two weeks, concluded at midnight last night as Phuket begins to enter its annual tourism high season. Of note, 80% of respondents to the poll were expats or foreign visitors to Phuket. To see the full poll results, click here. If your preferred response was not available, feel free to express your opinion in the comments section below. @ Phuket beaches:  Please, be patient. 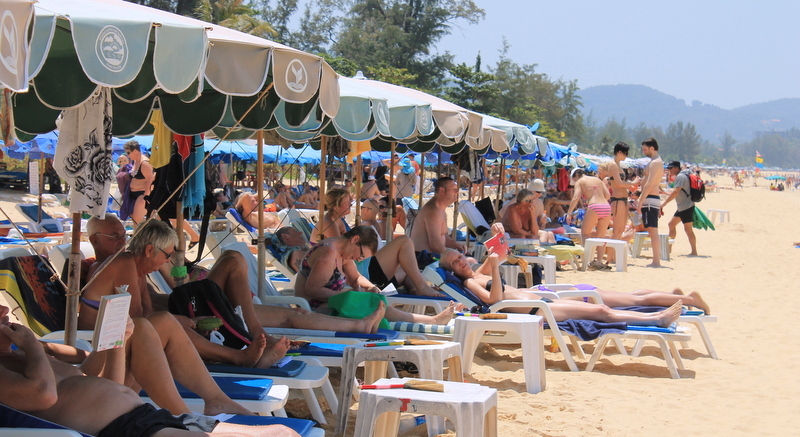 The Governor promised to take steps to clear all Phuket beaches of vendors. Just be patient, The Governor is just still warming up to start to executive this heavy task. @ Jome, Hahaha, You describe a Singapore scene.! Yes, the scene in S'pore attracts indeed quality tourists, as we all know. As you describe, Phuket has many years a lot of work to do first before quality tourist will favor Phuket ( again). Why would Phuket need Virgin Beaches or spend effort or money for the beaches at all???? How about that fact they are allowing beach vendors to move the towels of swimmers ( Who don't pay ( so they can replace them with beach mats and umbrellas for paying customers? This happened to me at Surin Beach on Wednesday. When i was swimming, i saw the beach vendor dragging my towel 10 metres down the beach and then replacing the area with a mat and umbrella for 2 paying customers. It is very simple. What was not virgin anymore for many years (Phuket beaches), you can't go back in time and make it virgin again. Once not a virgin anymore, never a virgin again. Thai authorities have to come up with another concept to promote the Phuket jewels, the beaches, but when they want to attract foreign tourists again, they have to think and work out 'foreign'. No...: No chairs, no vendors, no beach cleaning, not waste water management. YES:. :Illegal chairs + umbrella's, illegal vendors, and free release of waste water from hotels, restaurants, laundries, including urine and faeces. What was illegal until 2.5 years ago and banned, is back! eric dekegel @ And which vendor on the beaches pay Tax in Phuket I can tell you 0 vendors, jet ski ,food every thing.Thake the all  from the beaches in Phuket. eric dekegel@ Taxpayer in Phuket ?? tell me ho pay tax in Phuket, my wife pay tax every mount but in Mars /April she go to Tax office in Chalong and get all Tax money back. I've said for the last few years that tourists come to Phuket for 3 reasons - culture, beach, and nightlife (good and bad). If Phuket continues to restrict the beach's attraction by not having chairs, umbrellas, vendors, bars and restaurants, tourists will go elsewhere where they are welcomed.